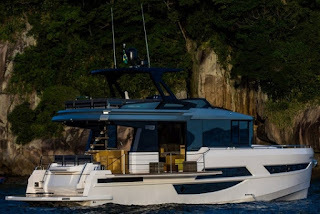 Okean Yachts is a boat builder from Brazil who born in 2015 present its first 50 model, launched in 2017. An explorer yacht of the modern type, the Okean 50 competes with the likes of Azimut Magellano and Absolute Navetta range in this growing and interesting segment which the more time passes the more seems to become the future of yachting. The Okean 50 is designed by Italian Paolo Ferragni, a new name for the many though he has fifteen years experience in the sector and was involved in the Baia B50 and Sevolution project which unfortunately never saw the light of day. In the Okean 50 Ferragni presents a three cabins lower deck interior; owners at midships, three berth guest cabin to port side, and a VIP forward. Living is all located on the main deck with a one step split level saloon, which gives way to an astern galley. The Okean 50 also features opening side balconies like Galeon which can be used while at anchor, and when opened increase beam by 1.80 meter. The Okean 50 can be powered by four Volvo engine choices which start from the IPS only 300hp and go up to V-drive shaft only 550hp units. The Okean 50 is proving to a success with ten units delivered in its first year of production and with the Brazilian boat builder already planning for two larger 80 and 66 models. Decent post. Here you share the immense data about the scholastic written work for the Ph.D. understudies who are looking information about it. Each understudy ought to visit site to get more data about the composition. This article is extremely educational.